Assault Suit Leynos recently came to the US by way of the Playstation store, and is a remake of an old Mega Drive/ Genesis game (renamed Target Earth in the US). I was surprised I had not heard of the game before, since I loves me some mechs. Maybe it was a combination of not having a Genesis as a kid (I was a SNES guy) or that the cover looks like a guy in a suit, not a mech. Either way, I can now experience it on a modern console. The remake boasts better graphics, rebalanced gameplay and a few other tweaks. The updated visuals still hold true to the spirit of the original 2D sidescroller, and look good. Character portraits look like they came out of the early 90s and I like it. There is some voice acting in the game, but the dialogue is kept fairly minimal, which feels appropriate. The main menu has the arcade game, but it does help to try out the tutorials, which are tucked away in the options menu. These help give you a basic grasp of the controls, while providing small stages for you to complete. Strangely, they can be a bit difficult, and you can even die during one of them. They have timed goals that thankfully you don't have to meet, but the operators will yell at you for not doing well enough. The arcade mode offers 8 stages that are tweaked versions of the original. Some of them are pretty hard, testing your skill and loadout management. As an example, stage 3 took me numerous attempts. I got through 1 and 2 the first time I tried them (I wouldn't say they were easy though), but stage 3 slammed me back down. After learning what to do and figuring out a loadout that complimented the enemies I faced, I was able to make it through. The following stages didn't test me as much as that, but they were still harder than the first two. Learning enemy layout and what to bring helps a lot. You can also change the difficulty if you so choose. Movement in Leynos is decent, more so if you have the boost pack equipped. This gives you a dash and a little extra on the jump. The movement of the suit does have a bit of momentum on it, which can cause you to move a bit further than you intended. This is really problematic around traps and pits, but not as much during a majority of the game. There are some stage sections that are less platforming and more free-floating, mixing up the action a bit. The mech can aim its gun a full 180 in front of it, but trying to get a specific angle can be a bit trying. Aiming is quick, so it is very easy for me to over or undershoot the angle I want. There is a button for locking the angle when you do get it, which is supremely useful. Another problem I have with the shooting is the big dead area where your shots do not hit. Sure, it makes sense since it is your whole mech, but it makes it hard to hit enemies near you (punching is an option, but still not the best). Combine that with how loose it is about walking backwards while shooting instead of turning to shoot, and it is a recipe for trouble when trying to eliminate flanking enemies quickly. Aiming straight up does like to pan the camera a little too far in that direction, which makes it harder to avoid hazards near your feet. These are not huge problems, but they are annoying to me personally, and make it harder to run and gun accurately. I was mostly used to them by the end of the game, but I still don't like them. On the positive side, your mech's health will regenerate if you don't take damage for a few seconds. This can be absolutely critical in passing the more difficult stages. You can also equip extra armor to get a health boost, and a shield that you can use to absorb enemy fire. While there are downsides to the shield (you can't shoot with it up, and it takes a second after releasing the button before you can), it is almost a necessity to have going through the game. Get in the habit of relying on it early. Before each stage, you can pick your loadout from your available weapons. The weapons have no descriptions or stats, but at least they have a small video that shows its attack pattern so you don't just have to pick everything at some point to know how it works. You have up to six slots, but things like the shield and booster pack take one of those slots if you choose to take them. You unlock more weapons as you go through the stages and perform various tasks. You can get multiple of some things, and they do stack. This is useful for some of the stronger guns that have no reloads, but you may sacrifice weapon diversity to do so. It's a nice open-ended system, but there are weapons that are much better suited to certain stages and situations. In theory you could pick just about anything if you are good enough to survive, though. Additionally, the game contains a mode that more closely resembles the Mega Drive version. However, it is tucked in the options menu instead of the main menu. I wondered why that is until I played it. It's ridiculously hard. Even though I had beat a few stages of the main game by that time, I couldn't even complete the first one of the "original" version. It still controls and looks the same, but isn't re-balanced to be something playable. Instead, you get a near constant stream of enemy grunts shooting at you. I could either stay alive and constantly get pushed back, fight back and die quickly, or make a run for it and die eventually. Yikes. Playing that mode made me glad I didn't play the original, as it seems like a nightmare. Being an older action game, it theoretically doesn't take more than a couple of hours to beat the game. In practice, the difficulty adds time to that. Plus, since some of your weapon rewards are dependent on your mission performance, there is replay value. If you are crazy, you can even attempt to beat the Classic Mode, or unlock all the bonuses. Each stage section unlocked is also replayable, which should help you clean up any trophies, or even practice a problem spot. I heartily endorse selectable checkpoints in action games, and am happy to see them here. While not a long or easy game, Assault Suit Leynos is worth playing for fans of older action games. It's presentation is nice, the gameplay is decent and there are reasons to replay the game, other than because you blew up. Zosaly isn't going to save himself! No, seriously, he's not. You have to figure out the trick to do it for him. Old school arcade action with a mech suit! I likes to get difficult at several parts, and the aiming could use a little work. I'm really tempted to try the actual original version to see if it's that difficult. 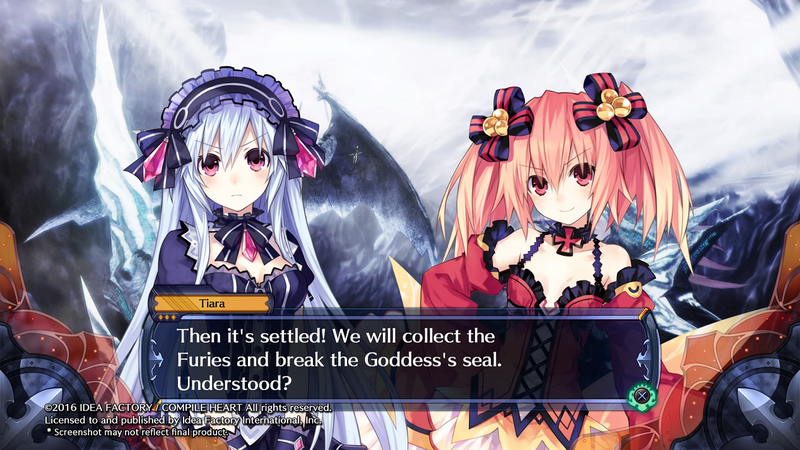 Fairy Fencer F came to US shores on the PS3 two years ago, but has received a face lift and new added content for its Advent Dark Force release on the PS4. Besides looking better, the game has added some content to the original story line, plus two new routes for players to enjoy. The party battle limit has also increased from 3 to 6 - a welcome addition in my book. One of the newer story changes is in the first 10 minutes of the game, where a new dungeon has been added. It also seems that the game has relaxed a bit on the missable quests. You can still mess up an entire playthrough if you aren't careful, but it isn't as easy to do so as it was before. My only gripes with the new additions is some of the dungeons are very dark, which strains my poor eyes, and how easy it is to miss the new routes. To make your way through the game, you basically view an event scene (usually in the town), and then proceed to the next dungeon to beat the boss and further the story. Dungeons are zones that allow you to run around, do some light platforming, find treasures (hidden and not) and battle enemies. 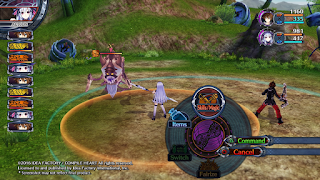 Enemies wander around the map, and if you make contact with them, a fight will start. If you manage to hit them with your weapon, then you get a preemptive strike, allowing you to move first. If they catch you from behind, or early on in your attack, then they get the advantage in the ensuing scuffle. Each dungeon can have anywhere from 1-5 areas to go through, and most of them have a save point near where the boss battle occurs. 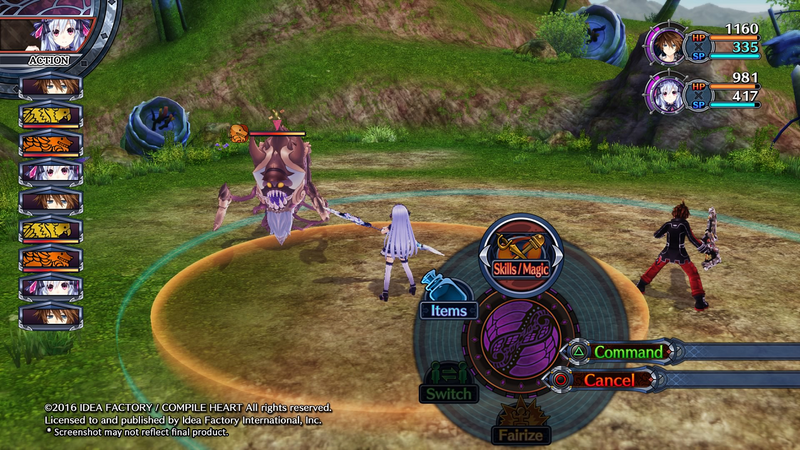 Battles have a lot in common with the game's Neptunia cousin. When you character's turn comes up, they have movement and attack radii. It can be tricky to move around some of the other enemies and characters to get to the fringes of your movement when you need to. Normal attacks can only hit one target, but the radius is one of the stats you can increase, ending up with a very large zone to target an opponent. Eventually, your characters will have access to a combo that allows you to set your attack strings, and you get three separate ones to boot. To fill these out, you will purchase attack moves from different weapon types as you progress through the game. You can mix and match as you wish, but each attack has a certain wait value, that will push off your next turn, so it might be in your best interest to not put on all the strongest stuff. Plus, enemies are weak to some kinds of weapon attacks, so it is also not best to fill all three strings with your character's default weapon. There are also launch attacks to allow you to air combo enemies, which are fun and also practical (since any breakable parts will take damage in the air, regardless of weapon type). Next to your character's portrait there is a tension meter, which will allow you to Fairize. This temporarily merges your character with their fairy partner, giving them awesome and impractical anime armor. It also boosts their stats and gives them access to their super move. It's a very good thing to get you out of some of the harder fights, and it seems to last longer than the original version. The furies you get through out the game can be infused with extra powers with the Godly Revival system. Each fairy has a rank, which determines what power set you can give it. These will affect the character that equips it, but also can be used on the world map. A fury can be stabbed into the ground, and provides its battle effects to whatever dungeons its area touches. They have a variety of effects, from raising and lowering stats, giving extra money, or even changing what enemies appear. The latter is very useful in getting certain drops or completing several quests. It's a unique and cool system, but every positive or useful effect unfortunately also comes with a negative one. Even knowing several things to do because of the PS3 release, it still took me over 50 hours to complete my first run through the game. Granted, I was grinding for several hours to finish some of the quests so I could get better stuff next run, but it is still a beefy runtime. While this encompassed a few changes, I still had not run into the new story paths. At first, I figured I would need to beat the game once to make them available. I was wrong. You do have to repeat the first half of the game normally (about 10-20 hours into the game) before you can do the completely new story routes. There is also zero indication how to get to these new additions. I had to look up info on the Japanese release to see what to do. I don't think it is too much to ask to have some indication to the player what you need to do in order to see this new stuff, since I'm sure many of the players of this were also fans of the original release. We already have to do the whole game over again because we can't import our saves, so why try to have us spend even more time we don't have to? Part of me thinks I should have seen this coming, given how the game likes to make things missable. The new game plus the game has is very, very good, though. It shows you what carries over, and even allows you to disable certain things if you so choose (I keep it all). This makes subsequent runs much, much faster (I got through the first half of the game in 4 hours). Plus, you can keep using party characters that you don't have access to. This is important, since different routes have different usable characters. 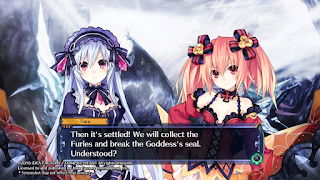 Overall, I am very happy with Fairy Fencer F Advent Dark Force. I liked the original release, and this is even better. I like all the changes and new content (except for how dark some of the dungeons are). I would say the game is worth it for JRPG players and fans of the Neptunia series, and any others that wanted to play it but waited for this release. If you played the PS3 release, it is worth it to come back, unless you are unwilling to play the game over again. At least you theoretically only have to do half the game over again to get to the new content. That you still have to put in about 15 hours to even get to, assuming you accidentally trigger the new routes, or look it up. It would be nice if the game told you! Seriously, I would have liked to know...I ended up going through the game twice (65+ hours!) to get to the new routes. At least I have the trophy for beating it on hard now. Also, did Tiara get a new voice actress or am I crazy? The Technomancer is an action RPG set on the planet Mars, where a young technomancer must struggle to survive. If part of this sounds familiar, it is because the game is made by Spiders, and set within the Mars: War Logs universe. As was the case with that game, I really like the setting, society and world created for the game. There is a lot of thought into how it all evolved, and it works well. As with most other RPGs, you will be walking around towns and dungeons, conversing with people, looking for treasure and getting into trouble. I'll give the game that it has lots of nooks and crannies that have loot in them, and there are valuable skills (like lockpicking) that have more than a few places to give you even more. However, I still have problems with this part of the game. First is the smaller problem, which is the camera. When you are not in combat, the camera is just too close to the character for my taste. It cuts off the feet, making it harder to see things close to the ground. I didn't see any option to zoom out, which I would have liked. Second, and much more annoying, is the character's move speed. It's just too fast. I know it sounds like nitpicking, but when it is obnoxiously easy to overshoot treasure chests and run past enemies you were trying to sneak up on, it gets in the way of enjoying the game. You can move at a much more acceptable pace if you slightly tilt the stick, but having to constantly monitor that is annoying. Strangely enough, you can hold down a button to run even faster, which I found totally unnecessary. If the hold button speed was what he moved normally, and his normal speed was a bit slower (or had zero momentum to his run), basic movement in the game would feel much better, and would not be a constant negative to the game. Of course there is also combat in the game, and lots of it. If you thought the run speed was the only thing getting in the way of me enjoying the game, then you've got another thing coming. Fighting in Mars was rough around the edges, unforgiving and needed you to use your gun with way too limited ammo to make it through the game. The Technomancer somehow takes this in the wrong direction and has made combat even more convoluted. Now you have three different stances, each with its own set of weapons. In theory, it is really cool, so you can quickly switch between sets to fit your playstyle or the situation. First is the mage stance that has a staff as a weapon, which is great for area attacks. The second is the warrior stance, which has a mace and shield. The mace is in the middle, speed and damage wise, and the shield is the most useful thing in the game, allowing you to block and parry attacks. The third stance is the rogue stance, which uses a speedy knife and the gun. The knife is underwhelming, but the gun tries to make up for it at least. Early on, you get a small taste of what could have been. There are some really weak bug-like creatures that rush you in groups of 4+. The mage stance is great for them, since the staff can hit areas and kills them in 1-2 hits. This part of the game works, and gave me hope that the stances had some strategic use to them. However, it was not to be. I had to rely on the shield for just about everything else, since blocking is so necessary. Enemies are not just dummies for you to beat on until they are dead, since they back/side step every other hit, and counter you almost constantly. It's really annoying, not to mention that it makes the game a lot harder. That's just too much for the 'normal' setting in my opinion (which this is, obviously). Trouble is, the whole game is basically like that, but worse. Fighting an enemy one on one is actually fine and works well. Two on one is a little tougher, but can still be done with next to no problems. Unfortunately, they game routinely throws 4 or so enemies at you at once, which had me getting pummeled and reloading every minute or so. They also shrug off hits while attacking to give you some more cheap damage. I suppose that's why there is a disruptive attack, that doesn't seem to actually do damage. Besides moving all the time to dodge and counter, enemies like to surround you, so your block won't work. Well, at least you can dodge, right? Yes, but it's not very good. It doesn't seem to offer much, if any, invincibility. To add insult to your poor technomancer's injury, it queues up button presses so if you mash (to make sure it actually gives you the roll), so you will likely roll twice. It also likes to not dodge in the direction I am pressing, which always bugs me in games. Even if all of that worked, when fighting multiple enemies, they love to basically poke at you when you are trying to hit another, making safe combat take much, much longer than it should. If the enemies were like the bugs, and died in a few hits, this might actually work. Unfortunately, they seem to have much more health than they should (again, on the normal setting), bottoming out the fun-o-meter. Did I mention some enemies have guns? No? Well, they you can be as surprised as I am when I take a bullet to the back in the middle of fighting two guys in the corner. These guys can do a lot of damage before you even know they are there, since they don't stand out from the rest until they are actively pointing a gun at your face. At least the bug creatures have a bigger model for the ranged ones, so you can identify and eliminate them quickly. The combat is also very unforgiving. You die in few hits, which add up quickly when you are trying to fight several people at once. Frequently I found myself low on health in a matter of seconds, which not much I can do about it. Strangely, the boss fight at the end of the tutorial was easier than any encounter with humans. That just shouldn't be the case. I found the button combinations for using skills and switching stances to not be very intuitive, which then takes me precious time and attention to look at the screen to do. Yes, this got a bit better with time, but it caused me several headaches (and reloads) early on, which is not a great way to welcome players to your game. The difficulty was something that bothered me a lot in Mars: War Logs, and it is disappointing to see it not addressed for a sequel. It is more sad to see improving fights not only ignored, but almost laughed at by adding another layer of complexity (the stance switching). It just makes combat in The Technomancer much more awkward than it really should be. At its core, it should be fun, but it's just slapped with the Dark Souls stick to make it an overly difficult mess. If the combat were at least slower, to give you time to go through your various abilities and react to things before punishing you, it would probably make it tolerable at least. I tried setting it to 'easy' at one point in an attempt to make it better. It didn't really seem to make a difference. Well, now that we got pretty much all the negativity out of the way, I can cover a few small high points to the game. The equipment upgrade system from Mars is again present. You find a lot of raw materials that can be used to strengthen weapons and armor by adding mods to them. The mods (and even the equipment itself) can be broken down to reclaim materials and slots to use again. It takes some practice to fully understand it, but I do like the way it is done. Stat and skill points are gained at various levels, and can be placed in many different places for various effects. Skill points can also be used to modify the powers you get and change the way they behave. This is pretty cool, but it does take you a few hours to have the points to really start playing around with the system. I can see lots of potential ways to build your character, but you should evenly distribute your points across the trees, since you should be using multiple stances throughout the game. This does hurt the illusion of character choice, however. The game is supposedly about 20 hours, but that would definitely not account for all the loading you will be doing after each failed fight. Or maybe it just adds a lot of time for me (I could just be terrible at the game and everyone else is great at it). There's also a few different endings, and romance options with the party members to add some nice replay value. As briefly mentioned before, there is a difficulty option for any masochists out there (you can set it two levels higher for some reason), and of course achievements/trophies. I really wanted to like The Technomancer. The world the game has is cool and I would love to see more of it. The idea of the stances in combat is solid, but the execution leaves a lot to be desired. I could honestly get past the awkward buttons, fighting and high movement speed if the combat wasn't so punishingly difficult. It's just too high for my tastes. Instead of fixing what was bad about Mars: War Logs, it seems like they just wanted to make it appeal to the Dark Souls fan base with its cheap difficulty and bad controls. I would like to see the developer go back to the more simple, fun and balanced experience of something like Faery than this amalgamation. What parts of the game I do like just can't be overcome by all the things I didn't like, big and small. Just like Mars: War Logs, the setting and premise of the game are really good. Too bad the combat isn't. If I didn't say "awkward and difficult" enough in the review, here it is again. Honestly, if they made the combat turn-based, it would probably work out, and I'd like to see that. Or, just make the 'easy' setting actually easy and not '5% less hard'. 7 Days to Die has made its way to the Xbox One and PS4, and is a first person perspective game that combines survival horror with crafting. I imagine it as a cross between State of Decay and Minecraft. While it is a strange combination that could work, it is equally as likely to be a train wreck...so which way does it go for 7 Days to Die? In many ways it goes both. The game starts out by dumping you in a randomly generated wasteland with next to nothing (you don't even have the clothes on your back). From there, it is up to you to survive. The game does give you a few simple quests in the beginning to help you get started, lightly covering gathering and crafting. However, they don't offer much information on them...unless you check it in the quest tab of the menu. Most are self explanatory, but I was stuck on "upgrading" the frames for a while (use the LT on them with the appropriate tool). So some of the information I needed was there, I just had to know where to look for it and that I had to. That's very indicative of many parts of the game. It gives you some information, but much of the game is up to the player to figure out. It's a feature that I sometimes like, since figuring it out yourself or accidentally finding something new is wonderful. However, there are times you have to consult outside sources (the internet) to find out some basic information. That's a sure fire way to take a player out of the game. You find a lot of stuff while exploring the world, and pretty much everything has some use. You gather basic supplies and craft a multitude of things to use in the game, from building materials to food and weapons. Many things can be repaired, or broken down to use the materials for other things. You also have to manage your food and water levels to maintain your wellness. If you go too long without either, your max HP and stamina will go down. Fortunately, the reverse is true, so if you maintain them correctly, they will increase. There's also a temperature rating. Unlike the food and water ones, which I can deal with, I hate the temperature system. Every piece of clothing adds or subtracts from it, meaning if it's too hot, you have to take off your clothes (but leave on your cowboy hat and sunglasses!) to cool down. While I get the realistic aspect of it, it's obnoxious. There are a lot of clothing styles, and even armor, but you end up having to juggle it all around because it's warm or cold outside. I'd rather the clothing is more down to what you find and how you want your character to look instead of having to throw on (or take off) different things as often as you do. If a good solution to the problem is walking around with only a hat, bandanna and sunglasses, your system is flawed. Learning to manage your inventory and crafting recipes is important, but unfortunately, the menus feel really awkward. They are a combination of PC-like and console-like controls. For example, you can navigate the tabs and recipe pages quickly with controller buttons, but you select many things by moving a cursor. It isn't horrible, but does take getting used to, as does remembering where every recipe is and what materials you need for stuff. Many of the best recipes have to be found, and some items can only be found. Either way, you are again at the mercy of the random number generator. Building is the second component of the game. In some ways it is really nice, since you will usually place "frames" that are the outer parts of blocks, and help you rough-in the design. These can be picked up and placed easily. Then you "upgrade" them to fill them in and give them some durability. After this they can't be moved, but you can keep using materials to make them stronger from enemy attacks and to fix them. Digging up and placing dirt is a lot harder, as it doesn't use the great grid-like layout of building blocks. Instead, it is much more vector-based, or something similar. The effect of the dirt (or rocks) shrinking as you harvest them is pretty cool, though. There is also some gravity in the game, so you can't really build things too high without supports. If you do, they crash down. Problem is, the gravity seems very inconsistent. Once, I was climbing a tower, and it just started to collapse as I did so. It dropped me to my death. Annoyed, I set back to grab my stuff and found only part of it collapsed. I'm still not sure why, since it was standing in the first place. Another time, I was on a pier, and it just randomly collapsed. I fell 2 feet into the water and was killed. Again I set to get my stuff back, more annoyed and bewildered than the first time. A third time had the ground collapse beneath me and reveal a cave. I didn't die, but did break my leg. I managed to climb out and then was immediately mauled by a bear. 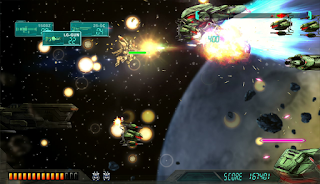 The third major component of the game is combat. It's also my least favorite. Thankfully is doesn't have to be a common occurrence. Most enemies you run across are just regular zombies. On normal settings they are fairly slow during the day. Because of this, or because you see many more zombies than you do other things, their attacks are really strong. Besides the chunk of damage they do, there is a good chance they will give you a status ailment, too! Wow, what a deal. Seriously, though it is annoying. The normal enemies are stronger and tougher than I think they should be, and that's only in the day time. Once night rolls around, they can run. Before it was usually best to just run around the zombie to avoid it, but that isn't possible in the dark. In fact, you aren't really safe in your shelter either. Nights in 7 Days to Die can be downright terrifying. Zombies can be straight up crazy, smashing through whatever is between you and them. Occasionally you even get a horde. Nights in the game make me look paranoid. When it gets dark, I tend to go inside my spike perimeter, shut the doors and wait around. I usually craft to pass the time, because there is no shortcut. It would be nice to sleep, but I assume your character is too scared to. There are lots of random noises that do make me jumpy. Even if you turn the enemies off, it is really dark outside at night. Yes, you can carry a torch or flashlight (assuming you can find one), but you would have to put it away to gather or build anything. You're just better off sitting inside and cooking or something. Death comes frequently in the game. It feels like it has a timer, and will send something to kill you when it thinks you have lived too long. I assume that's why there are achievements for living for longer periods of time. The penalty for death is a loss of wellness and some inventory (you can set what drops upon death in the options). It's honestly not as bad as it could be, but it is an annoyance. You can turn off 99% of the enemies if you are so inclined. This does cut down the number of deaths, and still leaves the game surprisingly fun. One great bullet point of the console release is the inclusion of couch co-op. So, I grabbed my wife and had her help me out. At first I didn't think she would like the game, but she quickly became addicted and we ended up playing a lot of the game together. For the most part, it runs fine, and you are allowed to get really far from the other player (we didn't hit any limitations on that). However, the game tends to hang up every minute or so while playing. It's annoying, and happens more often in co-op. Plus, sometimes one player will be stuck in a menu, or the buttons will stop functioning for a few seconds. It seems to happen when one person is in a menu or dealing with inventory, which is pretty often. Your maps aren't shared, and you have to remember to unlock any storage you create so the other player can use it. At least they give you duplicates of any schematics you find so you can share with your partner! Thankfully there are many options when making or loading a game to tweak your experience. You can have a random map, or a more starting friendly random map (it starts you near a shelter). There are options for loot amounts, enemy density (or off! ), daylight timers, and others. I strongly encourage you to mess around with them to find your sweet spot. It does make a difference! Since each world is random, there is a lot of replayability to the game. Plus, playing with friends always adds something. It can take a lot longer to set up a base and get supplies than you might realize, so it is really easy to play the game for a long time and not get much of anywhere. It doesn't bother me as much in 7 Days to Die, simply because I feel like I'm learning something most of the time I'm playing. Every once in a while, it will also throw you surprises, even if you've played the game for 40 hours or more. If you can get into the game, it has a ton of playtime. 7 Days to Die is very much a mixed bag. The visuals are dated, menus are awkward, and combat is not skewed in your favor. However, it can be very fun to play when exploring, finding new places and making better items. A few of the systems work okay, like the food and water. Others, like the temperature and wellness, not so much. I like that it tries to be realistic, but I wish some of the more unfriendly systems in play were more in the player's favor. I can easily see people not liking the game off the bat, but it does get better once things start to click. If it sounds at all interesting, I would encourage you to try the game for a few hours, as my wife and I have a lot of fun playing it. Exploring the random worlds can be really fun, and there is a lot of stuff to do and a ton of replayability. It can be hard to get the hang of menus, crafting, gathering and combat. I also severely dislike the temperature system in the game. Wow random animals can sure take a lot of effort to kill. Also I did track down the bear mentioned previously and ended his existence. Yay me! 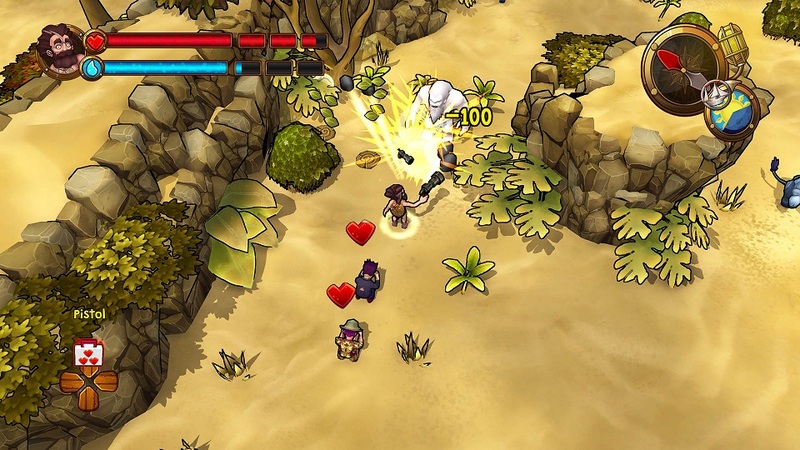 Lost Sea, from developer Eastasiasoft, is a remarkably different genre of game from their last offering, Rainbow Moon. It is best described as a Legend of Zelda-style rogue-like game. The game uses an isometric perspective as you make your way through several islands collecting tablets to ultimately try and escape the Bermuda Triangle. When you start, you pick one of the characters from a list. This choice has no real bearing on the game, it just affects what character model you use for the next few hours (or less if you are unlucky). You will start on a tutorial island that teaches you the basic controls and combat. Your main weapon is a machete. Monsters tend to have simple attacks and patterns, which is good because when you die, it's game over. Killing monsters gets you experience, but you don't level up like an RPG. This experience is used to buy player skills. There's a good range of stuff you can buy, from special attacks to more health and the ability to have more carry capacity. The goal of each island you visit is to find at least one tablet (out of one to three), which will allow you to sail to another island. The tablet has a random number that will determine how far forward you can move. In essence, they are like dice. Islands are randomly generated by linking together pre-existing tileset, and populated with monsters. Many times, there will be a locked wall and you have to find the key to open it. At the end of each archipelago, there is a boss fight, and then you move to the next area. Rinse and repeat until you can escape the triangle. As you make your way around the islands, you can find other stranded people that can join you. These people become your crew, and have different sets of skills to help you, which is good, since they don't help you fight. Instead, they cower in place when enemies come around, and tend to not move out of the way when danger arrives. Some of their skills will allow you to create bridges, dig up treasure, or unlock chests for usable items. Other skills are useful in battle, like more damage, more experience gain, or even a player revive. You will want to keep around the more useful members, especially since many of the abilities stack. Having four followers with "strength in numbers" lets you kill even the strongest monsters in two hits. The player revive is also wonderful, since normally a death is game over. It is difficult to keep them alive, since they seem to have a death wish. Not only do they do nothing to dodge attacks, they many times don't follow you quick enough to get out of damage zones, especially when you have three or four followers. They are also really good at getting stuck on the environment, and frequently I found myself having to backtrack to reclaim a straggler. You have to invest a lot of experience to have that many, but it can be worth it. They can be dismissed at any time, but will only follow you to the next island if they are actively following you around. Choose carefully! Bushes and crates around the island will give money when destroyed. Similar to experience, money will let you get upgrades for your boat. Some are very useful, like the one that reduces the experience cost for skills, while other seem less useful than they would appear to be. One inexpensive skill shows you a random tablet's location on the island. Since I try to fully explore each one, this isn't as useful to me. However, I could see it being useful to someone trying to speed run the game (which there is unfortunately an achievement for). A single session of Lost Sea can last a long time, which I didn't expect from a rogue-like game. It doesn't save during a run, so make sure you have enough time to finish before you start. Especially if you start from the beginning. I've had a run take about 5 hours, which is crazy without saving. Of course, if you start farther in, or don't do as well, it can end in 5 minutes. Thankfully you can warp through any zone that you have beaten the boss for, so you don't have to do the whole thing in one run, although that can help. If you do warp ahead, you get some experience and gold based off how many tablets you found last time, which is a decent way to offset what you are skipping. Overall, Lost Sea is a pretty fun game. Its randomly generated layouts give replayability, but can also make runs differ drastically in difficulty and playtime. Crewmate AI is spotty, but you have to put up with them to make it through the game, for better or worse. It definitely has its own style, and is worth trying for those seeking a high-stakes (in a game anyway) challenge. Randomly generated islands + rogue-like + treasure and achievements to collect = lots of play time and replayability. Your crew is as necessary as they are dumb. Sad (sahd? ), but true: I annoyed my wife by being late for bed one night because I had a good run and didn't end up dying until early in the morning.